My research at Gondolin demonstrated the absolute necessity of comprehensively developing South African localities by employing extensive in situ sampling and full palaeobiological analysis of recovered faunas; particularly outside of the well-developed and well-sampled Bloubank River Valley region near Sterkfontein. Since my PhD research I have stayed active in field-based South African palaeontology and continued my emphasis on controlled excavation of in situ deposits with comprehensive assemblage analysis (versus selective sampling and interpretation). This is an approach that my team and I have employed at new palaeontological sites like Luleche (Adams et al., 2007a), a small locality near Gondolin. Although no in situ fossil remains were ultimately located, a small collection of fossil specimens were recovered from an ex situ miner’s dumpsite. Adams JW, Hemingway J, Kegley A, and Thackeray F. 2007. Luleche, a new paleontological site in the Cradle of Humankind, North West Province, South Africa. Journal of Human Evolution 53: 751-754. The LD 13 reduncin (Redunca sp.) 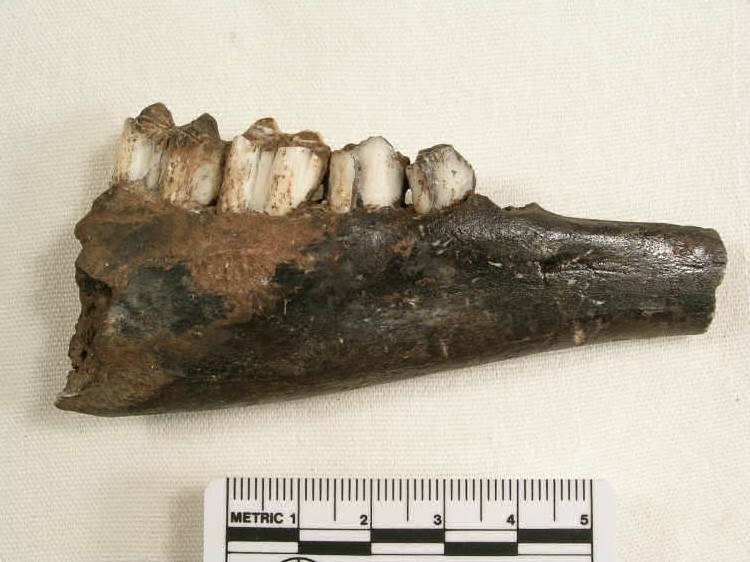 right mandible from Luleche.